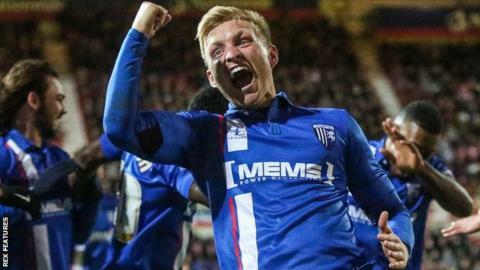 Gillingham manager Justin Edinburgh has praised midfielder Josh Wright for the attitude he showed in his bid to gain a contract with the club in pre-season. The 26-year-old trained with the Gills for free last summer and, after getting a short-term contract in August, has become a first-team regular. "It is a wake-up call to any player how quickly things can turn around," Edinburgh told BBC Radio Kent. "He was able to overcome the adversity of not having anywhere to train." Wright was a free agent after leaving Leyton Orient at the end of last season following the east London club's relegation to League Two. He came off the bench in Gillingham's victory over Sheffield United on the opening day of the campaign and, barring suspension and injury, has started every game he has been available for since then. "To come here and ask if he could train and then offer his services for no charge is a remarkable feat. It is a credit to Josh, his attitude, commitment and the man he is," added Edinburgh. "Things like that go unrecognised and unspoken about because players get a raw deal at times. "His performances have been immaculate and he has been a real mainstay of what we have done this season." Wright has helped the Kent club to fourth in the League One table, and he hopes he can achieve a second promotion with the Priestfield Stadium outfit. The former Charlton trainee had a brief loan spell with the Gills in 2008-09, and set up the winning goal as Gillingham won the League Two play-off final at Wembley - an occasion he describes as the highlight of his career. "To see how happy the fans and everyone was that day, I keep thinking about it every day," said Wright. "I would love to replicate that. "I know how near it is and how quickly it will come around. You can't step off the gas now as it is the business end of the season. "I have mentioned it to the boys and would love to be able to do it again this season."